Brent Hinkley, John Tufts, and Mark Bedard (top to bottom). Photo courtesy Oregon Shakespeare Festival. 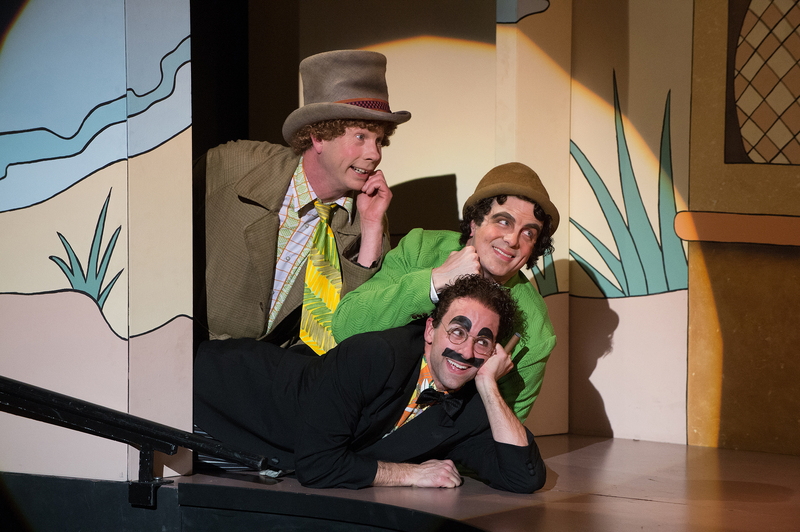 When Mark Bedard was performing the role of Groucho Marx in OSF’s 2012 rendition of Animal Crackers, he was also busy writing his own adaptation of the first Marx Brothers movie, The Cocoanuts. This year, the adaptation has been brought to the Ashland stage. Though it features the Marx Brothers zaniness one would hope for, it’s different enough from its OSF predecessor that it’s definitely worth attending. At its heart, The Cocoanuts is about two things: The Marx Brothers being funny and elaborate musical numbers. The former of these did not disappoint. Brent Hinkley and John Tufts reprised their roles as Harpo and Chico Marx, respectively; these roles, requiring spectacular choreography and the ability to work as a single comedic unit, were executed as effortlessly as the original Marx Brothers. Special note must go to Hinkley’s facial expressions–he manages to convey subtlety even in Harpo’s constant manic grin. The musical segments are as lavish and funny as they were in Animal Crackers, but are more tied into the plot of the musical instead of appearing as vaudevillian interludes. Key to these is Eduardo Placer as the hapless Zeppo (the only Marx Brother role to be played by a different actor); his nervous energy and impeccable choreography brings the songs together. The musical definitely feels like it was written by a playwright with modern sensibilities–Bedard moves away from the Marx Brothers’ vaudeville roots, turning the play from a variety show into a farce. Rounding out the play is the hilarious ensemble cast. K. T. Vogt’s Mrs. Jamison was my personal favorite–Vogt is a very good character actor (catch her in Two Gentlemen of Verona as well!) and plays a role as the stuck-up rich lady common to the subversive wackiness of the Marx Brothers. A stone-faced David Kelley plays the unfortunate Detective Hennessey (who gets probably the best song in the show), and Robert Vincent Frank and Kate Mulligan play a pair of devious thieves. If you are seeking exactly the kind of comedy you got with Animal Crackers, you will get mostly what you want. Though the structure of the plot is different, and even the gags have changed a little, for the most part The Cocoanuts is the wacky Marx Brothers antics you have come to expect.